Property Description: High Park Gem!!.. 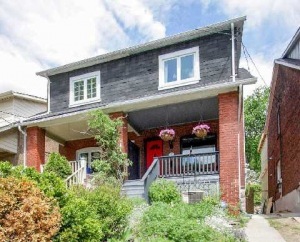 Renovated 2 Storey Brick Semi W/Charming Facade, Inviting Front Porch, Deep Landscaped Lot W/Stunning Rear Tiered Gardens,Open Concept Main W/Hrwd & Cork Flooring, Exposed Brick,Fireplace,Steel & Tempered Glass,Custom Cook's Kitchen W/Breakfast Bar,2 Storey Addition Incl. Family Room W/Cathedral Ceilings,Skylights,Architectural Windows & Walk-Out, Spacious Bedrooms,Tastefully Renovated 4Pc W/Skylight, Tons Of Natural Light, One Of A Kind!